New construction misting is becoming more popular in upscale neighborhoods such as Hideaway in La Quinta, The Madison Club in La Quinta and Big Horn in Palm Desert. 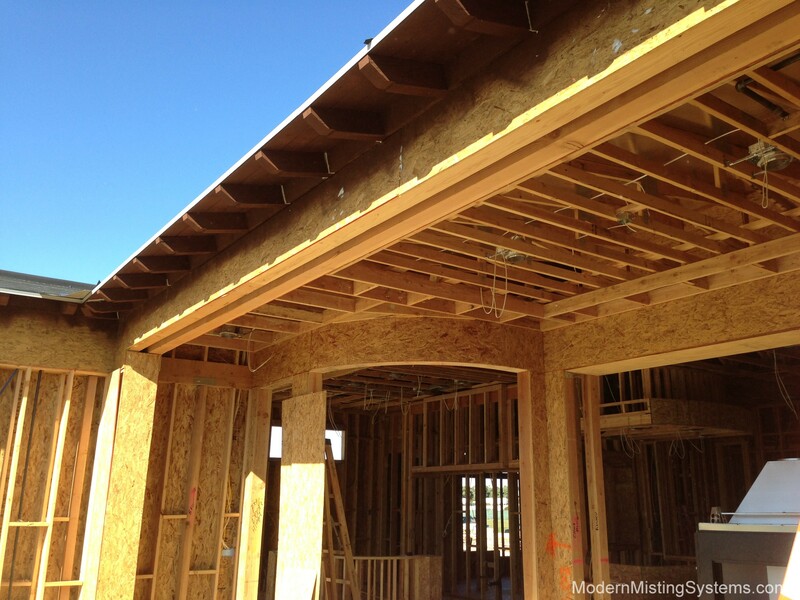 If your home is under construction or is being remodeled, we have the ultimate application to integrate the system into your construction completely. It is a custom extruded channel that can be architecturally integrated into the new construction or remodel. Before the home is stuccoed we can install a recessed track molding with stainless steel misting lines flush with the finish of your home. The recessed channel that we use is a 1″ aluminum frame called a fry reglet. This fry reglet is integrated into the design of your patio, whether it be stucco, rock fasica or wooden tongue and groove. Once the reglet and finishes are complete, we come back to install the 3/8″ stainless steel misting lines inside of the gap created by the reglet. We then install a custom built cover with holes pressed into the channel where the nozzles will spray. This cover can be painted. It can also be built out of custom material such as stainless steel, copper, or an anodized aluminum. Once this stage is complete, you have a patio with a custom integrated misting system that is hidden in the finish of your home. For more information about Pre Installation of your misting system please give us a call at (760)345-9429.